Perhaps the secret of life is telling a good story. Think about it. Every social interaction, every nugget of information we give, can be provided in many ways. Ultimately, many times the story format is most appropriate because it speaks to us from one person to another. Perhaps the answer to all the world’s troubles, and perhaps a few of mine, is to strive to tell a good story. And, as we tell these stories, to be truthful just about always, in an appropriate manner for each situation. One of the big challenges I struggle with is, “What exactly constitutes a story?” It’s not enough for people to tell me something or for me to hear something. I’ve got to process it to understand it. So in my process of great understanding, I fed this data into my subconscious and put in a ticket for tech support to come up with something meaningful and applicable to my daily life. When the motor of my mental machine stopped whirring, I ended up with what I hope is a good working definition of a story for my own purposes. For example, I could tell you that I took a trip to Savannah this weekend. It was four hours’ worth of driving each way, and I traveled with three others on the way up and two others on the way back. Our accommodation was a three-bedroom vacation rental. We visited the beach at Tybee Island, and walked around the historic districts of Savannah before leaving. I’ve conveyed raw information to you, but there isn’t much value to this information on its own. I’m leaving an awful lot to your imagination. You might infer that the beach is a pleasant getaway and that the three-bedroom vacation rental was pretty spacious. I didn’t qualify any of my descriptions or tell you if the trip was bad or good. But you do know that I went, and you kind of understand what I did. In short, the information I gave you wasn’t anything different than what you could have researched in a travel pamphlet. Most of all, there’s no value attributed to it, and no color or description. If I turn this information into a “story,” then you start to get a little more information and there is more meaning and value to what I’m telling you. I could say well, it was a long day on Friday after struggling through a challenging project, but I escaped and made it out there. We were late thanks to me and got to Savannah at 1 a.m., checked into our beautiful rental with the gorgeous wooden trim and historic decor, visited a famed local bar and woke up late the next day. We had a marvelous day at the beach under warm skies, fanned by warm ocean breezes. After a lovely dinner at the brewery, we took a walk by the river to the sound of live music blaring from the buskers and bar bands. And then the next day, we had brunch before touring SCAD’s art shop and the historic cemetery where Capitol Records founder Johnny Mercer is buried. The statue featured on the cover of “Midnight in the Garden of Good and Evil” was discovered in that same cemetery yard, but it’s not there anymore. On the way back, we tried the famed Stickyfingers barbecue chain, which isn’t available in Atlanta. And then we crashed and went to work again. 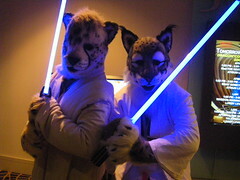 That gives you a lot better idea of what we did. There’s a fair amount of description and context there. I could go even further and talk about the personal situations of each of us, give more details about the area and perhaps discuss the wonders of our living accommodation. There’s a host of other devices I could use to expand upon this. So I think it’s interesting to give conscious thought to how we convey information to others, and to consciously think as we are having experiences, “What will I tell others about this?” I think for a skilled storyteller, things like this are second nature. Some people seem to be built to be journalists and love to tell a tale. It’s something that takes practice and work to perfect of course. I’m not sure where I fall on this spectrum. It depends on what medium I’m using to convey the information. I do know one thing, however. I’ll be thinking a lot more about the story I want to tell about XYZ experience as it happens. As I type this, my cable Internet access is down for the count. Unfortunately my former backup ISP has wised up and password-protected their router, so I’m pecking my post into the notes field of a fake address book entry so I can sync it up on my iPhone. Besides sucking, this also cuts me off from what I viewed as my last “resort,” if you will: the Virtual Vacation. Call me pathetic, call me what you will. But when I feel the need to travel and can’t, jumping on Google Maps and streetview is probably the closest I’ll get. You might wonder why I don’t, you know, just go somewhere. Or, just learn to wallow happily in my faux-misery mudhole. The answer is, I have a vacation planned in early June and, well, life is too short to let it slide by. I also just bought a fairly expensive camera to take on future trips. I’m happy about this investment but also have to be prudent about my dollars. And, I have activities planned this weekend, and some fairly ambitious travel plans later in the year, and some anxiety about anything but the minimal amount of planning (due to the unpredictable nature of my job and lifestyle). So I’m not necessarily complaining or anything, I just want to be able to sample all that life has to offer. When you’ve got gadget lust and wanderlust at the same time, sometimes you have to make compromises. And so, the geography major in me jumps at the opportunity to take an interdisciplinary approach to escapism. That is, using my computer and other modern technology to experience the highways and byways of my country, as well as the cultures of the world. It’s kind of exciting, and has the benefit of plenty of context and never really getting lost. You are truly free to go places you wouldn’t otherwise go and discover dream destinations you never knew you wanted to see. It’s comforting to know that I’m actually not the only person who does this. I read a story in the New York Times detailing how two friends — caught in the throes of wanderlust — got together and pretended their mice and keyboards were the dashboard of a car. Streetview became the vehicle by which they took a road trip on their screens. They actually made a viral video bloggy-thingy about it that includes their dialogue and observations of the “roadside attractions” seen via streetview, which, the article wisely observes, aren’t that much different from what you might say on a real road trip. My mind was a little blown in that moment, not so much in the earth-shattering way, but more in the synchronous way. I totally *get* what they are trying to accomplish, as well as the implications of it all. That and the interesting phenomenon of one-minute online sensory vacations, kind of got the wheels spinning in my brainz. To what degree can you experience a place without actually going there? And how accurate is your research versus the reality? I’m trying not to *go there* in terms of virtual reality and holodecks and simulations, but that’s somewhere in there, too. I propose an exercise: Plan a virtual vacation in as much detail as possible before an actual visit, and then actually go there and see how it stacks up. Just to get a little weirder on you: There’s a possibility that taking a virtual vacation before a real visit could have profound implications on your actual viewpoint when you go. And there’s also the possibility that taking a virtual vacation could be just as fulfilling as a real vacation, since one could argue that even “reality” as we know it is constructed from perceptions. French philosopher Jean Baudrillard explored the simulated nature of perceived reality in his diatribe, er, treatise, Simulacra and Simulation. He basically argues that reality as we know it is to some degree symbolic, and that the simulacrum (symbol) is increasingly trumping that which it symbolizes — and I know that’s oversimplifying things. From a scientific perspective, I can’t help but think we’re just a mass of atoms and particles and whatnot, organized somehow via energy and sculpted by the hands of the deity of your choice. What purpose does travel serve then? And is going somewhere — an inherently symbolic experience — truly different than simulating it? Well *of course* you say, traveling to another place is a fulfilling experience for the sights, smells, activities and interactions with other human beings. Is it? I would tend to agree with you, but I think it’s something interesting to think about, particularly when life gets in the way. Back to earth now. The takeaway from all this early-morning thinking I’m doing is that there is a ton of value in trying to construct an image of a place, only to tear it down by actually going there. You get more out of the whole experience than the sum of the two stages of analysis, because there is a certain synthesis that takes place during the transition. And even if you don’t ultimately end up visiting a place — perhaps the virtual vacation helped you avert disaster, or you just can’t get around to visiting this place, ever — these short escapist journeys undertaken with mouse and keyboard can be quite valuable. Regardless of their accuracy and depth, they’re their own kind of vacation in and of themselves and can let you go places that you would never get to go otherwise. I’m going to tick someone off, and rightly so, but my recent taste of the UK gave me the impression that London is just like a city in the United States, but maybe a little wackier and a little hipper. Am I wrong? Then again, the UK has yielded things like Are You Being Served?, much of PBS programming in general, Monty Python, Mr. Bean and Thomas the Tank Engine (and Ringo Starr). Paris, on the other hand, can claim Babar and Madeleine. That should give you an idea of my experience. I arrived on a Eurostar a few days into my trip across the pond and for the most part I was thoroughly relieved to be around people who in theory speak the same language as me. Mind you, all that “Feeling peckish?” and “lift” and “Mind the Gap” stuff was a constant reminder that I was no longer in Kansas, but things were familiar enough that I was OK with being so far from “home,” wherever that might be nowadays. As I sit here in Arizona typing this post, I am a little floored at the culturedness of London. Its Tube underground, while crowded and filled with people who are walking way too fast and stressing way too much about missing trains that come every two minutes, is pretty good and pretty useful as long as you’re not handicapped. The whole city is pretty and cultured. The food is tasty. There are literally things to do and see around every corner. There aren’t so many skyscrapers and it’s not nearly so urbane as New York, but it is very hip and the open-air markets are a nice change. A lot of my impressions about London were wrong for the most part. The weather was nicer (still a bit chilly, but pleasantly so) and the people were all about being outdoors. It wasn’t that foggy (certainly not like San Francisco) and colorful things could be seen everywhere. The people have a delightfully wacky sense of humor and you just get the sense that culture is brimming from every chimney. Now for the weird stuff: I got really tired of climbing stairs. Sooooo many stairs. It was really bad. There were a few escalators but in general walking around London left me hurting really bad during the trip and for about a week after. I think I’m still feeling some residual effects now that two weeks have elapsed. If you wanted to go to the restroom you had to go downstairs or upstairs (true of Paris as well) and there was just a lot of stair climbing to do. I had a strange hotel room. Trying to find a place to stay was not easy but I found something. Coming from an odd hotel in Paris, I was sure that anything else would be normal, but I was wrong. I found a place that was safe enough, close to transit at St. Pancras and in general convenient as all hell. It even had a fresh English breakfast each morning consisting of eggs, sausage, toast, tea, juice, grilled tomato, baked beans, etc. That was a plus. But it was a strange room. I had to take the stairs to the third floor. The hallways were narrow and split by fire doors that you had to go through, and then the room itself was pretty small. The bathroom was elevated up onto a platform. My sink had separate hot and cold faucets so that your hands would never be comfortable when washing. There was no phone or clock in the room, and so no wake-up call of any sort, but there was free wi-fi. Still, not too bad, I guess. Could have been worse, and it was clean. The strange hotels are part of the travel experience methinks. Oh yeah, so what did I see? My first stop before heading to bed was Piccadilly Circus, which had glittery neon and gawdy shops and the Trocadero mall with its weirdness and its danged pay toilets. I found an awesome souvenir shop that sold killer merch; I returned the next day to buy something and the store had been closed and completely stripped of its goods. In the morning and on the next day, I visited everything you’re supposed to: Walked by the London Eye, Parliament House, Westminster Abbey, the Changing of the Guard, St. James’s Park, Hyde Park, the Marble Arch, the Tower of London, the Tower Bridge, the Tate Modern and the Globe Theater. Bridges were everywhere and it was awesome. I took a side trip to Camden Town, which is like Atlanta’s Little Five Points on a much grander scale, and grabbed some gelato amidst the open-air markets of Notting Hill (which is sort of like Decatur, GA, on a much grander scale). Open-air markets are the thing in London. Before I left, I dropped by Turner House to pay a short visit to some of my colleagues in distant lands. To arrive at a satellite office of my workplace when so far from home was a very strange feeling. I had also browsed some neighborhoods and had Persian-Chinese fusion cuisine. Trafalgar Square was nice, as was its view of Big Ben. I liked the wacky charm of Soho and the international flavor of Chinatown. All in all, so much to see and do! I’d like to go back and see everything I missed. It was a good trip and full of good humor and great underground art. 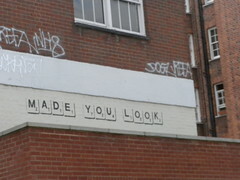 At left is a Scrabble sign posted on a building in Notting Hill. It’s so pretty and hip in London. I want to go back and explore the UK, especially Scotland. I also want to see Ireland. So we’ll see. I also want to go to Spain, Italy, Germany, Greece, Switzerland, EVERYWHERE. Lord help me. Thanks for reading. I departed for Paris on September 24, 2009. I arrived at 8 a.m. the next day after a layover in Philadelphia and an ensuing 8-hour flight, plus the 6-hour time change. After fumbling around for a bit at Roissypole and then crashing in Room 666 at my very strange little Parisian hotel, I was well on my way. 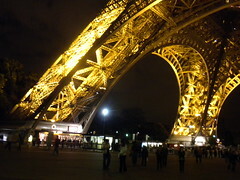 The first night, I went all the way to the top of the Eiffel Tower and looked out the window. Great view from the top. After a good night of rest, I visited things such as Notre Dame cathedral, the Louvre, the Montemartre butte and Moulin Rouge, Arc de Triomphe, the Pantheon, the outside of the Montparnasse cemetery, parks, cafes, McDonald’s and KFC. You can buy beer everywhere, even at the fast food places, and it’s a lot cheaper than paying 4 Euros for a Coke. I wandered around the Pompidou Centre and strolled down the cobblestone streets of the Marais and other neighborhoods. Good times. I left for London in the middle on the Eurostar and returned to spend one more night. Unfortunately, the Catacombs appeared to be closed due to vandalism. The Metro was my primary form of transit and it did me right except when I really needed it to be on time; and it was during these times it screwed me over. My last night I had a weird hotel that had slanty walls but was otherwise pretty nice, so I could forgive the strangeness. On the way out, as I said, I had some Metro and RER issues that resulted in my almost missing my flight to Philadelphia. But I made it, and here I am. People say the French people are mean and whatever, but I found them to be more helpful and less crazy than the British. My biggest gripe was with the high cost of beverages and things in general. The Euro is very strong, and a four-Euro cola comes out to about six bucks. It’s like the whole region of Europe is one giant ballpark when it comes to buying a beverage. I guess a small “price to pay” if you will, for a nice trip and a “Seine” of good things to come with international travel. I guess today was a blessing in disguise (a very convincing disguise) as I got to experience a great cross-section of the Bay Area region. My original intention was to get up early and get to San Francisco before noon so I could relax, take in the sights, get a feel for the lay of the land and such. But the city that I’ve wanted to visit for oh-so-long had other plans for me. So I got up bright and early, packed up my stuff, nearly lost my hat in a rush and headed out into the mystic. I ended up at the airport, went through security in a chaotic rush and was told there were delays due to low clouds. Long wait. We finally got on the plane and waited some more. And then we took off! Only we didn’t. The plane started to go up and the pilot pulled it DOWN. And then we waited for a while and then we got off. And then I waited in line for a long time. It was 6 hours after my first flight that I finally got through a line of people with a ticket for a new flight on a tiny commuter jet to San Jose, not SFO. I said OK, I’ll take it vs. waiting another three hours to catch a direct flight. So I left the secured area, ran to a bus stop with all my stuff, hopped on a bus, went back through security and headed on over to the commuter area. The commuter jet was one of those tiny jobs, one seat on one side and two seats on the other. No propellers but still small. I even walked out on the tarmac to get to the plane. The ride itself was fine, smooth, about an hour long, complete with cranapple. I shudder to think that a ride on that little thing was deemed safer than on the big thing, but I guess a functioning plane is best. I always seem to have these mechanical issues on Star Alliance flights in particular. Maybe I’m on crack, or maybe they all do it. Who knows? Anyway I have a $150 certificate now for a United flight. So I got to San freaking Jose and it was all desert-y and hot and sunny. Weird. Almost like Palm Springs. I didn’t expect the Silly Valley to be like that. And then I got on a shuttle bus to Santa Clara, where I saw a model train museum that was pretty cool and then hopped on the double-decker CalTrain commuter rail. From there, I got on BART and then I wandered downtown to my hotel. After that I wandered to the Embarcadero, the SF Bay Bridge, Union Square and the general area around my hotel. All in all, I got a pretty good summary of the Bay Area given that today went so horribly wrong. I’ll have more on impressions of the city later, but suffice to say it’s lovely. There is lots of music and activity and cable cars and pretty Gothamistic skyline-ness. I don’t know if you’ve ever experienced a moment so wonderful that you didn’t want to taint it, but at one point I was walking and there was saxophone music playing and a cable car passed by me (one of those retro buses, glowing in the night) and it would have made a postcard picture, but I didn’t reach for my camera. I just savored it. The sounds and smells of this town change and morph as you walk by. It’s a great place to walk around with a recorder, taking in the changing sounds of the traffic signals and the squealing whale calls of the BART trains. One thing though: transit is way expensive and I’m scared of the Muni and all the different breeds of buses and cable cars. There’s always tomorrow, but I’ve got to figure out a way to get around. I think this qualifies as an epic fail today, but it turned around to become an epic win. The blessing in disguise is I really got to see a cross-section of the city: from the sunny, desert surroundings of Silicon Valley to the foggy, touristy, romantic, romanticized, almost New York-like pulse in the urban heart of San Francisco.